Pahrump Valley residents, it is time to prepare to get up and get those bodies moving. 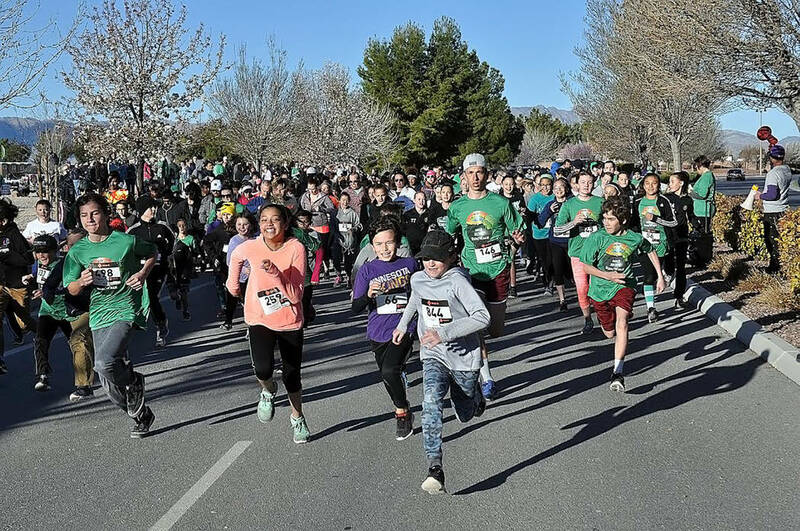 Horace Langford Jr./Pahrump Valley Times Participants in the 2018 HOPE Run/Walk a pictured making a mad dash from the starting line in this file photo. This year's event is set for March 30. 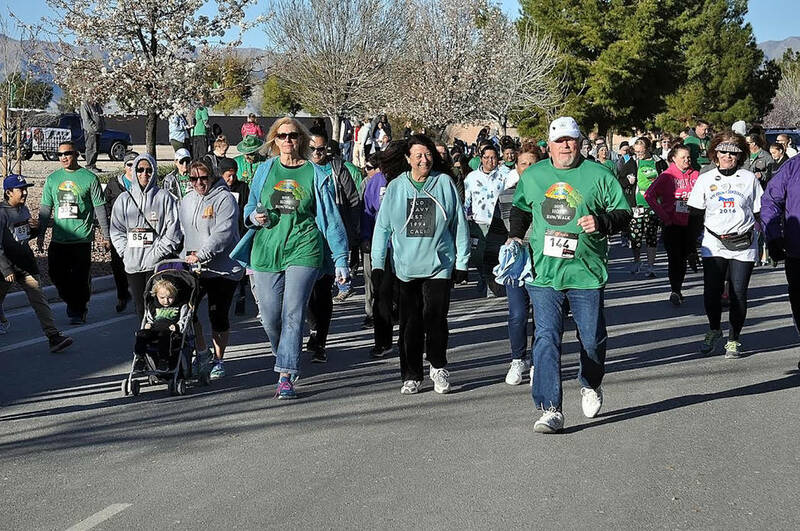 Horace Langford Jr./Pahrump Valley Times More than 500 people gathered for the HOPE Run/Walk last year and event organizers are hoping for just as successful an event this coming Saturday. 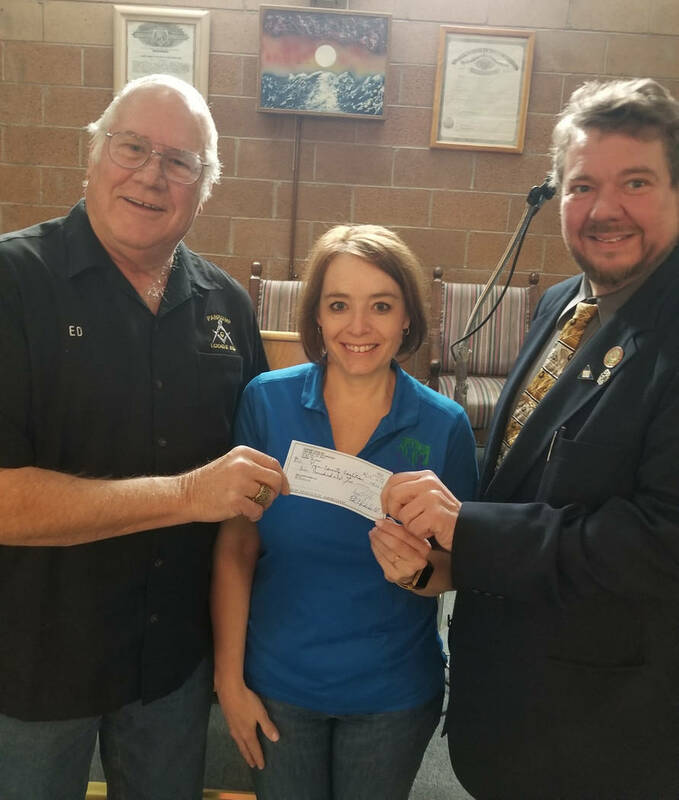 Special to the Pahrump Valley Times The Pahrump Mason Lodge 54 donated a $500 check in support of NyE Communities Coalition's 11th annual Hope Run/Walk event. Pictured from left to right is Lodge Treasurer Edward Underhill, the coalition's Tammi Odegard and Mike Burkintus, Master of the Pahrump Masons. The NyE Communities Coalition’s 11th Annual HOPE Run/Walk is right around the corner and everyone is encouraged to participate. Geared toward promoting active, healthy lifestyles, the run/walk helps raise money for drug, alcohol and tobacco prevention programs in Nye, Esmeralda and Lincoln counties. The event is scheduled for Saturday, March 30, with those planning to take part gathering in front of the Mountain Falls Clubhouse bright and early that morning. The race is set to start at 8 a.m. and attendees are asked to be sure they arrive well ahead of the start time. The race will include two options, a 5K fun run and a one-mile walk, making it a perfect outing for people of all activity levels. While not a competitive event in terms of racing itself, the HOPE Run/Walk does come with a challenge attached as teams vie to bring the most participants and take home the prestigious HOPE Cup. Last year it was the huge team from Rosemary Clarke Middle School that secured the win, with 185 students, teachers, parents and staff heading out to represent the local school. Teams will have their work cut out for them and must gather as many participants as they can if they want a chance at claiming the championship and the HOPE Cup this year. Registration is $30 per participant and can be completed either in person or online. To register in person prior to the event visit the NyE Communities Coalition campus, 1020 E. Wilson Road in Pahrump. To register online visit www.active.com and search for NyE Communities Coalition. Registration may also be completed up until 7:45 a.m. at the event. For more information contact Tammi Odegard at tammi@nyecc.org or 775-727-9970.